This is a post announcing some content you may or may not enjoy here over the next two weeks. As widely as a writer can be considered a genius, David Foster Wallace is considered a genius. And he is one, insofar as his train of thought is so far beyond, say, mine, that I can’t even begin to quantify that distance. But he’s far from infallible; and I feel mildly safe in presuming he would agree with that. So my admiration of him is not as a genius. It’s as a writer with an incredible ability to turn a phrase – some a few words, some full paragraphs-long – in so many different ways. They foster laughs; slight smiles; fear; depression; claustrophobia; delight. But my most common reaction, by far, was, “Gee, that was clever.” And I think that means more than it might seem. 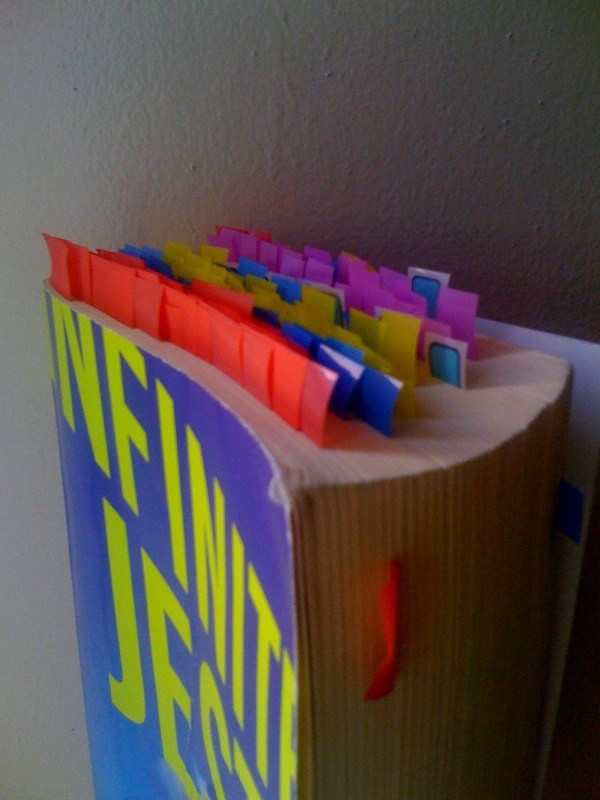 I don’t usually mark up novels, and have never plastered one with sticky notes, like the book you see above. But if I was going to read 1,079 pages, I was going to remember the parts I liked. So that’s what each sticky note represents in the picture above: something I liked. There is certainly no system, color-coded or otherwise. So, enjoy. First up, later today: People.